Recently I have been practising my Illustrator skills to get them up to date in Adobe AI CC. Rather than produce artwork without a purpose, I decided to set myself a little side project to give me a purpose to create the artwork. The artwork will be used to make my first ever Skateboard! I thought it would be a fun project, allow me to create something cool that can be applied to something that people can have hours of fun riding. My inspiration for this tentacle design was ocean life and one creature in particular the Octopus. Stay tuned for the next stage in the process when I get the board made! I will be doing this myself so hopefully with some care and patience the final board should look pretty cool! This is the design plus mock up of what it will hopefully look like once the project is complete! Got the designs printed on glossy Vinyl ready to be applied to the board!!! The train journey into work can be pretty boring sometimes, so to make time go by some people read, others do crossword. I prefer to use this time to let my imagination go wild and to keep up with my drawing skills. So after a quite some time working on this project the commission is finally complete. As mentioned in the previous post there was one last element to add to this painting to transform it into something magical. We hope that you like the finished piece and it inspires you to create something magical of your own! Remember we would love to hear what you think about this piece of art so get in touch! So after many hours of painting we are almost there with the painting!!! Time to fur him up and make that mane stand out! Final piece coming very soon with a surprise that will be added at the very end to transform this painting into something hopefully magical! STAY TUNED!!! If this inspired you to paint something then send in your images to @jnpanimation on Instagram so we can have a look at your work! If you want to see more of our work then hit that follow button on the social media sites we are on! We look forward to seeing you there! 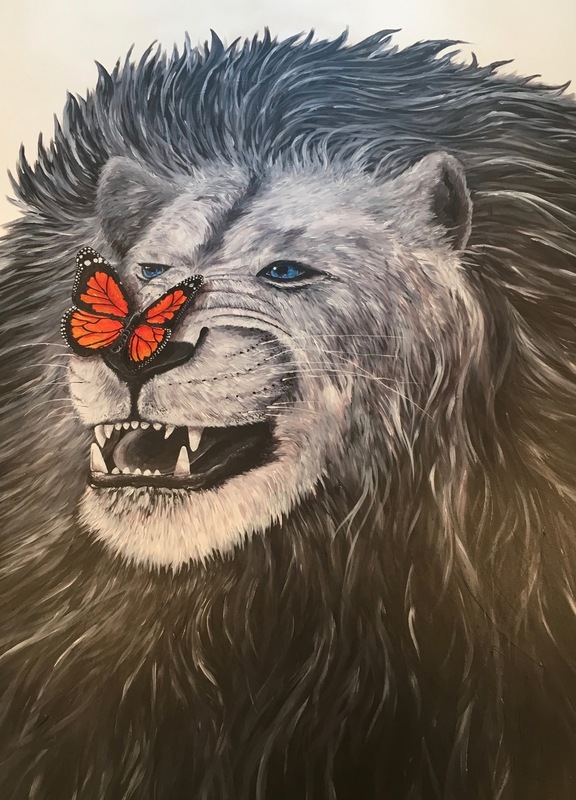 We were recently approached by a client who wants a mural of a lion for her bedroom, our canvas for this project is huge! We are painting with acrylic on a blank space which is 2ft x 6ft! This is one big lion!!! Follow us on Instagram to stay updated with our progress on the project! JNPanimation corporate is now live! Over the past few months we have expanded our horizons and now use the skills of illustration graphics and imagination to bring business ideas to life. We cover everything from business cards, posters, leaflets, logo design, banners, web design and more. If you need something created to help promote your business then don't hesitate to get in touch and hopefully we can make your ideas reality!!! So after quite some time since my last post it is time to reveal my newest project 'African Elephants'. This is a pencil drawing on paper and is the original artwork which has now found a new home with my client. If you want a commission produced of your favourite animal then please get in touch as I would love to do a lot more of these type of commissions in the future! I hope you like the artwork and stay tuned as I will be producing another original piece that will also be able to purchase in prints as well!!! So its getting really close to Christmas and hopefully you have all been good for Santa this year!!! JNPanimation is launching its Christmas competition open to everyone of all ages! So tell your friends and family and follow this tutorial on how to draw your very own cartoon Santa!!!! Then send in your designs ( the crazier the better ) to #JNPanimation or @JNPanimation to win a spot on our Instagram wall of fame!!! It will also go on other social media sites so make sure you leave your name and age and keep an eye out on JNPanimation.com where the winner will be announced on Christmas Day!!! Good Luck and get doodling!!! See the guide below to help you draw your own santa! Be sure to click on the image so you can see it in its best quality! So the best time of the year is here! A time for fun and happiness for everyone, even these two sea creatures are getting into the festive spirit! This is an image to thank everyone for the support that has been given as well as the interest in JNPanimation. Remember to spread the word with your friends and family that JNPanimation has landed and is here to bring all of your wildest ideas to life. Hello again to returning visitors of JNPanimation and a big welcome if this is your first visit! Recently I have been focusing on a commission of the Village People. It was a fun project as the idea was something totally different to my usual work. Commissioned by two extremely lovely people I was given the opportunity to bring their idea to life which is based around skulls, gay culture and the Iconic Village People who brought us some of the greatest hits such as, Macho Man, Go West and Y.M.C.A. The idea is Vibrant, a bit dark and comical, I really hope you like the idea! After completing this project I then had the opportunity to focus on producing a small range of stickers for Vibers latest competition on Talenthouse. The brief was to create a group of stickers which highlighted the things you love about your favourite city. Check out my entry by clicking on the below link and while you are there give the picture a like if you want to! Here is my entry, I hope you like them! Thanks again for checking my site out and remember if you have any queries or need anyone in animation to help on a project then please get in contact! I recently submitted a piece of work for Vibers sticker competition and they have kindly featured my work! Check out the video and keep an eye out puncher the profiterole! Good new everyone I have moved from working on my dining room table to an office space located in Sutton Business Park, Wallington UK! Now with a better working space for myself I will be able to post up more work for you all to see and focus on developing my skills in animation and the creative arts! If you live in the local area and need someone with the design skills to bring your dreams to life then please get in touch! I have also got a space in the office for consultations so if you want to discuss ideas, styles etc. it will be a perfect opportunity to fine tune your idea and will also allow me to find out more about you, to get you or your companies personality into the work I will produce. Its starting to look like my career in the creative world is starting to blossom, so keep checking up on JNPanimation to see its developments! Its been some time since i've drawn a large picture using my pencils, but after a few hours of doodling and drawing I came up with an idea. Its a little bit darker than most of my artwork however I really enjoyed exploring this new avenue of artwork, and will be creating some more pieces like this one in the near future so... stay tuned! Leave a comment below and let me know what you think! If you follow me on twitter, instagram or Facebook you might have seen the latest edition to my Johnny's World artwork. In this piece we can see Johnny rescuing a Killer Whale and her calf from a whale show. As some of you may be aware there has been a lot of news over the past few years about the captivity of Killer Whales and the confined space they live in, so, I thought it would be a fitting idea to focus on as it is also an issue that more people need to be aware of. So here is my contribution to help raise awareness! As a children we always think of weird and wonderful ways to solve problems for the greater good despite the ideas being near impossible. I guess this idea is a reflection of myself too as I think if anything was possible I'd save a killer whale with balloons! Pros: Great drawing experience. Brilliant HD screen. Very easy to take out and about. Easy to use and get used to. Pen Capabilities are amazing. Lightweight. Cons: You need to remember to buy an adapter. Android apps for use out and about, in my opinion aren't as good as professional software when plugged into your Mac which is expected. Stand is flimsy and not as sturdy as it could be. As you may have seen I have just been working on a side project called Johnny's World (see post below). To create this illustration I was using a fantastic product made by Wacom called the Cintiq 13HD. It gives the artist the ability to create any type of artwork using minimal resources and giving fantastic end results and its all on one screen. Personally I feel that this product is as good as drawing on paper if not better in some cases as you can still achieve the 'natural' drawing look even though the work is being produced digitally. However you will need a good design package to work with when using the tablet so that you can achieve the right styles you are looking for, my personal favourite is Adobe Photoshop, with is limitless capabilities as well as it user friendly interface I would say that both the Wacom and Photoshop work in harmony with one another. When using Photoshop or any other software the tablet will need to be plugged into your laptop as it becomes a secondary mirrored screen. All programmes in the adobe suite work really well with the Cintiq as well as other programmes such as Mudbox, Maya, and Corel Painter. I feel that the wires sometimes get in the way as there are quite a few that need plugging into various points and they are quite thick, one for the thunderbolt display port (you will need to buy an adaptor for the Mac which comes to roughly £20) one in the usb port, one plug socket and the last one for display HDMI port on the Cintiq. There is also a stand that comes with the Cintiq which has three tilt angles so that you can be as comfortable as possible when using it, I find that the stand is quite sturdy but it falls out if you lift the unit up to manoeuvre the screen, it is only a minor issue though. Wacom Cintiq 13HD Multi Pressure Standard Pen including replacement nibs. The tablet also has other capabilities that allow you to use it while on the move. With a built in android interface you are able to download design apps, watch videos online, surf the web, play games and more. With downloadable programmes such as sketchbook pro available for the Cintiq 13HD you have the freedom to use this product as your sketchbook when you are out and about, its lightweight, comes with a protective case, theres no wastage of paper and if you forget your equipment then there is no need to panic as it is all built into one screen! And with a good battery life you can take all the time in the world to produce your artwork! The only issue that I have with use of the Cintiq out and about is that the programmes that are available don't have as many capabilities as when using it with professional software, however, it does allow you to produce work with some really good results even though the software is fairly basic. This isn't down to Wacom but to the android app store. The Cintiq also comes with a fantastic pen, with 2,048 levels of pressure and tilt sensitivity, it's fantastic for when I produce some of my more detailed and intricate work. If you love drawing with high levels of detail, like myself you will fall in love with the pens abilities. As an animator I also need to ensure that I can clearly see everything that I'm working on in the best quality possible, the Cintiq 13 HD, although fairly small in size in comparison to the other Wacom Cintiq products such as the Cintiq 22HD and 27QHD it still is, in my opinion, on the same level as the larger models from my use of them. I find that I am still comfortable to use this the 13 HD even after several hours working on a project, some people do find that the screen is quite small and don't stay on for prolonged amounts of time. or click here to discover more about the Cintiq 13HD! If you enjoyed this review then please keep an eye out for more reviews on products that I use and the artwork I produce, if you haven't been to my main site and would like to pay a visit to JNPanimation then please click here.